Scott's Service Centre has been open since 2013, owned and operated by Scott Edgell. Prior to setting up the business Scott worked in various garages across the North East to get experience with all types of makes & models. 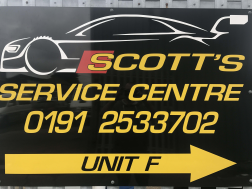 Scott's Service Centre operates a 3 ramp workshop catering for all cars and we also offer a free collection/delivery service within a 10 mile radius of the garage. Scott's motor mechanic was very friendly and knowledgeable, i am very happy with the work that was done. I could not fault the service. Scott was absolutely amazing!! From start to finish he was friendly, efficient and got the job done for me in a short space of time. Would highly recommend this service and Scott without a doubt!! Thank you. Scott was excellent. Very punctual and although he was only asked to fit front brake pads i asked him to check the rear which he was happy to do and said there was still plenty of life left in them, so no "extra!!!!" work needed. I have already recommended ClickMechanic to my family. Fantastic service. Vehicle was collected at an earlier time to fit round my working patterns and dropped at my front door the next afternoon. Sorted quickly. Happy with service. Car picked up in evening and back next day by midday for timing chain replacement. Arrived within stated time (which was less than 24 hours after requesting job) All work was completed on time with no problems and at stated price. Couldn't ask for more.